Traveling abroad is often painted as this totally fun, Instagram worthy experience—which it can be—but there is so much more to the story than can be captured in a picture. Culture shock, anxiety over traveling, loneliness, and various obstacles and challenges are common occurrences when spending time in a new country and learning to live within a new culture and language. But fret not! We’re here to help you explore some ways to manage your mental health while you’re abroad. With these tips for managing your mental health, internships abroad will be rewarding and growth (and Instagram) worthy experiences! 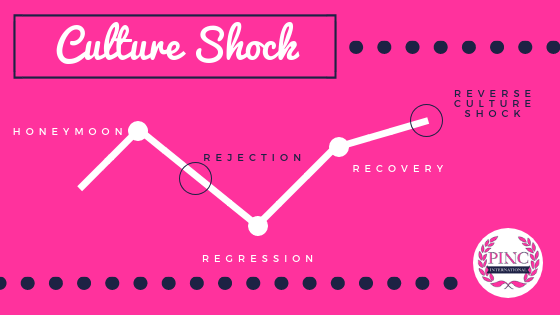 So… What is culture shock? Culture shock is an experience of disorientation while living under new circumstances, in a new culture, or unfamiliar practices/ways of living. It can be exhilarating—and overwhelming. One of the best ways to prepare for the experience of culture shock is to understand culture shock symptoms and become familiar with the culture shock stages that you may face. Honeymoon – Everything is exciting! You feel as though you can handle the differences and you feel happy and elated to continue with this experience. Rejection – Things start to not go as planned and the realities of the new culture feel a bit overwhelming. Regression – This feels like the pit of the experience, the moment you hit the point where you make the decision that you need to surrender to the process in order to move forward. Recovery – If you are able to work through regression, you may start to feel accepting of the new culture, and you may begin to adopt some of the differences into your own day-to-day life. Reverse Culture Shock – This happens to people who become fully immersed in a new culture and have a hard time re-adjusting back into their home culture. While experiencing the ups and downs of culture shock, you feel many different feelings—excitement, joy, anxiety, depression. All feelings are valid, and as overwhelming as they may be sometimes, it is important to address how you are feeling in order to find the best ways to take care of yourself and to move forward. You will have highs, and you will have lows. Embrace each stage, they have something incredible to teach you, even if it is hard to see in the moment. How do culture shock and mental health intersect? While experiencing culture shock for the first time—or the fifth—your mental health may change in ways you have never experienced before. That is why it is important for you to know what to expect, as much as you can, from reading about the challenges you may face when experiencing life in a new and exciting place! Culture shock is temporary and may cause temporary differences in your mental health. But if you have existing mental health issues before going abroad, they are not going to go away just because you are going to a new place. Either way, it is important to prepare before you go, set some plans in place for while you are gone, and think about how to address reverse culture shock, or the readjustment period that is inevitable after your time away. Before you leave for your transformational international experience, identify the people who serve as your support system when you are at home or at school. Talk to these individuals and set a plan to talk with them while you are away, or ask them if they would be comfortable with supporting you while you are gone if you are experiencing some changes in your mental health. It is important that you are comfortable talking with these people and that they are good listeners. They may not be able to relate to your experiences while you’re abroad, or even give you the best advice, but at least they can be a listening ear so that you know you have someone to support you during the highs and lows—you’ll want to share both!! What are you expecting to learn from this experience? What goals do you have while you are away? Is there anything specific you hope to accomplish? Why do you want to go abroad? These are just a few examples of questions you may want to ask yourself before you leave. That way you have a set idea of why you are doing what you’re doing—a good reminder for when things get challenging—as well as a way to give yourself concrete goals that you can address or reflect on when you are feeling low. Your answers to these kinds of questions may change over time, which is 100% okay! But it is nice to have something to look back on while you are away. This can be done in many different ways, but a good example of reflecting on your pre-abroad feelings is to write a letter to yourself to read once you’ve completed your time abroad. It may help your post-abroad reflections as well as show how far you’ve come. It is also a good habit to get into for while you are abroad and need to process how you are feeling. Sometimes writing it out helps us to explain to ourselves how we are feeling or why. This may not be everyone’s cup of tea, but there is a way to make journaling accessible to everyone. If you don’t want to write about your feelings, or document what you saw, did, and learned, you can always start by writing down three things you are grateful for. This is especially helpful when you are experiencing some lows. Taking a step back, reflecting on how we are feeling, and recognizing what we are grateful for, no matter how we feel in that moment, is a great way to begin to move forward. Getting your body moving is a great way to not only release some happy endorphins, but also to explore your new home! Go for a walk around the park, do yoga session on the beach, find some friends and play a pick-up game of soccer! No matter what it is, the physical exertion will help you process and release your inner thoughts and feelings. Plus, it’ll keep you healthy and hungry for all of the new foods you can try! Breathe in, breathe out. Sit in silence. Picture yourself on an island in the middle of a river. Your feelings are floating in the water, coming near to you, and then passing by. Picture your challenges and obstacles floating with the current as well. Coming close, and then passing by. Sometimes slowing down our minds and visualizing the release of what we are holding onto, helps us to do just that—let go. Find ways to make meditation work for your mind and body. This is often a challenge when moving to a new place, especially abroad. Open yourself up to your immediate community—the other people on your program. They are going through exactly what you are going through, and chances are they are experiencing many of the same highs and lows. Therefore, they are a great starting place to develop some deep connections and bond over how amazing—and challenging—this exciting time in your life truly is! Plus, they double as travel buddies!! You can also build a relationship with people you pass by day-to-day, people who live in the same building as you, or even your co-workers! There are also plenty of apps, such as MeetUp, that allow you to meet new people who share similar interests. Always be careful when meeting up with potential new friends though—always better safe than sorry! As humans, we thrive on routines. They become habit and second nature, so we don’t have to overanalyze our movements day-to-day. The quicker you set a routine, the quicker your body and mind will adjust. This sense of normalcy will help with your mental health because it narrows down the new experiences you are taking in. The first few days, or maybe even weeks, will take some getting used to. But, be patient with yourself! You’ll get there eventually. 6. Find a Therapist Who Can do Virtual Sessions—Yes, They Exist! If you are worried about your current state of mental health, talk with your therapist or counselor to see if they would be willing to set up Skype calls while you are away, or if they have any recommendations for support while you are gone. This is a great way to continue with your normal self-care routine, as well as having a backup plan if things ever get too overwhelming. You can also check out Talk Space, which is a texting therapy communication outlet that allows you to have sessions and support just through the convenience of your phone. This may be complicated with international phone plans, but is still definitely something to consider! They are the people who were there when you did that really embarrassing thing that you don’t want anyone to know about. They are the people that remember that story that is too hard to put into words. And they are the people that felt all of those feelings, and now they are feeling all of these new feelings of coming home, too. There is no one who will relate with or understand your experience as much as the people who went through it with you. Don’t forget about them when you say your tearful goodbyes, make plans to stay in touch—and follow through! Their support is invaluable. You just came back from an AMAZING experience abroad and you want to share every detail with all of your friends. Chances are, as excited as they are to see you again, they may not want to hear about the best sandwich you’ve ever eaten, or that time you almost missed your bus. More often than not, they will ask some big sweeping, general questions that will be hard to answer like, “How was it?? ?” and then they’ll move on. Some people may be more willing to listen than others, so make sure to set your expectations accordingly. And, don’t forget that their lives continued while you were gone, too. Ask them questions and make sure the catching up is mutual. They’ll appreciate the effort! It is common that you time abroad has exposed you to some new passions, or has changed the way you view your old interests. Be intentional with your time when you return home or to school. Did you fall in love with photography while you were away? Join the Photography Club on campus. Did you love learning a new language? Pick up a few additional language courses and catch the latest international flicks at the indie theater in town. It may feel hard to imagine, but there are new things to explore back on campus or in your hometown too. You don’t have to be abroad to feel the excitement of trying something new for the first time. Find those places at home and continue the adventure!